The whirlwind visit to New Zealand by the Duke and Duchess of Sussex last week was closely watched by a dairy farmer’s wife who once made Prince Harry’s grandmother tea and pikelets. The 1990 farm visit – the Queen with Don and June Ferguson on their farmhouse front steps. June Ferguson served up the pikelets and blueberry tarts for the Royal afternoon tea back in 1990. 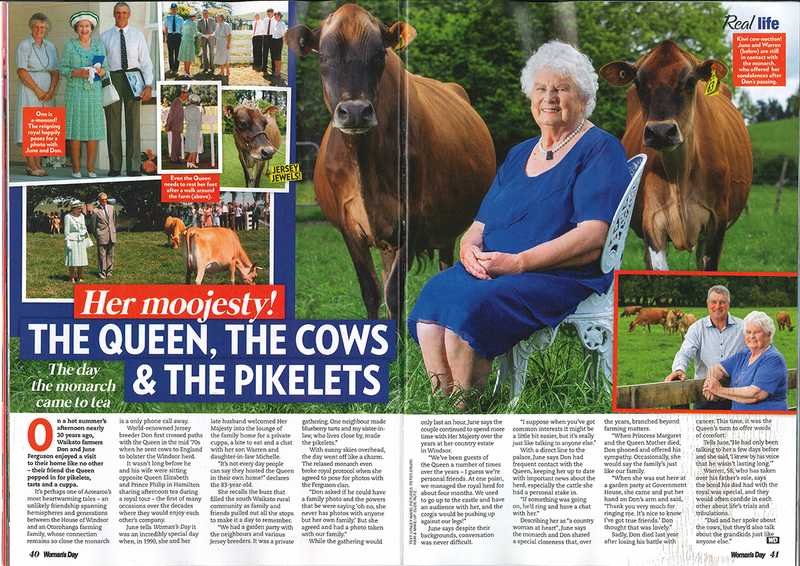 It was just one of many personal and professional occasions she and her late husband Don enjoyed with the Queen, thanks to their mutual love for animals and shared interest in dairy herd breeding. Don Ferguson established Ferdon Jerseys (now Ferdon Genetics) in 1949, and went on to become internationally renowned for breeding show-winning Jersey cattle. He passed away in February last year. Today, Ferdon Genetics and the family farm, located near Otorohanga, are run by their son Warren and his wife Michelle. “Like most farmers, my Dad was very proud of his cows and took great care of them, as we do today. When you’re a farmer you get to know your cows, what they like and don’t like, who’s the leader of the pack, and their different quirky characters,” says Warren. “Dad was delighted that Her Majesty the Queen was just the same. She has a real eye for the best breeding, and is well known for her appreciation of race horses, but perhaps not so well known is that she also admired dairy cows – and she was particularly keen about our Ferdon Jerseys. Connie donned a little tinsel for the Royal Visit. She’s from the same family as one of the very first young Ferdon cows to be sent to the Queen in the mid-1970s. At one point another of Don and June’s sons, Lindsay, worked for the Queen helping to look after the Royal herd. The Queen visited the family farm in 1990, and there have been many visits by the Ferguson family to Windsor, Royal Ascot, and the Royal Yacht Britannia. 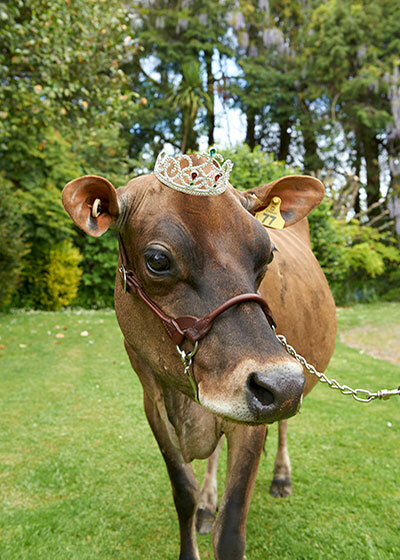 There are also cows on the Ferguson farm that the Queen and the family jointly own. Don and his dairy cow breeding genius first came to Queen Elizabeth’s attention in 1975 when he and June were visiting England. They were at the Royal Show, and Don was less than impressed by the Royal cows on exhibit. Being a forthright Kiwi dairy farmer who was passionate about his finely bred cows, he gave his opinion to the somewhat startled Royal herdsman. Don’s credentials were confirmed, however, when he showed the herdsman some photographs of Ferdon Jersey cows. An English breeder, who was nearby and had been a judge at a New Zealand show the year before, also spoke up on his behalf. This was the beginning of the Ferguson family’s Royal connection and friendship with the Queen that continues today with regular contact now undertaken by Warren. Soon after Don and June returned home from that first visit to England, two young Ferdon cows were sent off to join the Royal herd, closely followed by two Ferdon bulls. Then during the 1977 Royal Tour to New Zealand, the couple were invited to meet Queen Elizabeth and Prince Phillip over afternoon tea at Te Rapa Racecourse in Hamilton. 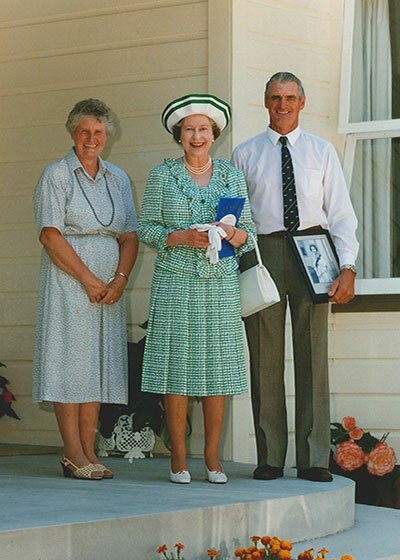 Don and the Queen stayed in close contact over the years with further Ferdon animals joining the Royal herd, and in 1990, when Her Majesty was in New Zealand to open the Commonwealth Games, she visited the Fergusons at their farm. The family and the local Otorohanga community pulled out all the stops for the special visit with June serving the Queen afternoon tea in the farmhouse’s front room. 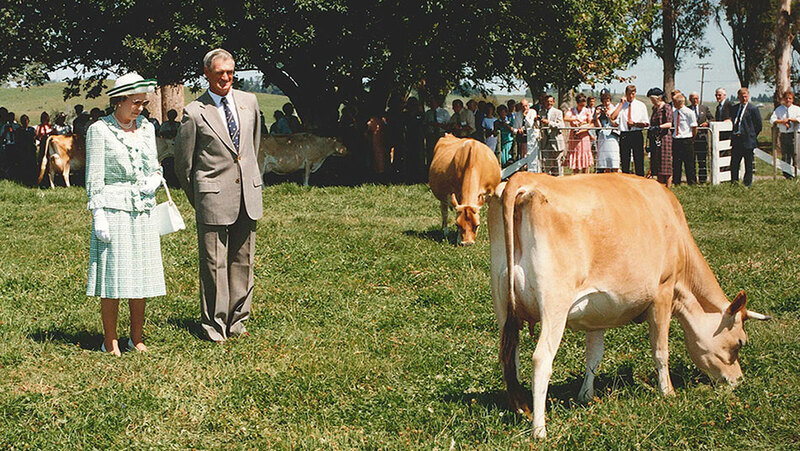 The 1990 farm visit – the Queen and Don Fergusson in the paddock with the Jersey cows. June recalls that the Queen’s Lady in Waiting was fascinated by the blueberry tarts, not having tasted blueberries before, and spooned the fruit out singly. Following her visit to the Fergusons, Queen Elizabeth invited Don to help prepare her herd for a World Jersey Bureau Conference. He and June spent four months living at Windsor Castle near St George’s Chapel where Prince Harry and Meghan (and Princess Eugenie and Jack Brooksbank) were married. Over the years the regular phone calls between the Queen and Don became wide-ranging. Conversation was not just restricted to the prize-winning animals they were breeding and showing – some in New Zealand and some in England – and the cows’ various personalities. They also talked about family, their farms, the weather, and race horses. Warren Ferguson says while he is in regular contact with the Queen, especially when their cows are being exhibited at shows, he does not have the close friendship with her his father enjoyed. “Dad was one of just a handful of people who was able to call the Queen directly,” he says.